Reliable is what everyone says when they pick Verizon for their cell phone plans. With a huge signal coverage, consistently top network speed and high performance, Verizon is truly an unstoppable force when it comes to quality. If you’re here in search of which network is the best, we’ve got you covered with our reviews for AT&T, T-Mobile and Sprint. Also check out our guide on The Top Rated Cell Phone Plans if you want to see the best of the best. Without further ado, here is our review for Verizon. We’ll be focusing on 3 types of plans: Unlimited, Prepaid, and Family. Each of these should give a good outline to help you consider which Verizon plan you should take with you for the rest of your entirety. We will be going into extensive detail for each plan and a brief summary one by one so you’ll have a good grasp on what’s in store for you. In all honesty, Verizon is quite beefy when it comes to the price. We won’t sugarcoat this one at all–it’s going to cost quite a lot per month but for good reasons–high-speed network, vast coverage, additional perks, and unthrottled data for both 4G LTE and mobile hotspot. Some may think this is overpriced but it’s worth every dollar thanks to their excellent performance. Yes, the prices can be quite the eye opener and that’s just the basic plan too. While there are other better starter plans out there, this one is okay. What’s worth the money in Verizon’s line of unlimited plans, nonetheless, is the Beyond Unlimited plan which we will discuss later on. What you won’t get here are HD streaming and unthrottled mobile data. Not to mention you only have 600 kbps of mobile hotspot speed. If you’re watching a Netflix live action show with the most inaccurate adaptation based off from the manga and anime and the hotspot exceeds, 600 kbps, it’s over. I've been with Verizon Wireless services for several years and they appear to have the most reliable service and signal availability. I am currently out of the country. I was able to suspend services for me and my wife while easily continuing services for our son that remained in the states for college. So far, we've not had any issues. Josh **, from the Verizon in Goleta, CA is amazing. He is very professional, Knowledgeable and I was able to find a wireless plan that worked really well for me. I love my new G7 phone and services and will recommend Josh ** to anyone, he really represents Verizon really well! Verizon has been our plan since its inception. We’ve investigated other carriers plans and have found things we couldn’t live with - cost vs coverage, assistance in stores and online. Netflix needs at least 1.5 to 3 Mbps to stream in SD and without that, you won’t be able to watch the next season of Jessica Jones. Now let’s go to where the real magic happens: the Verizon Beyond Unlimited. The most basic unlimited plan. It’s got some nice starter perks minus the HD streams. Net speed also throttles quite a lot especially on busy days. Again, for budget-conscious users, the prices may look too high but for what you’re getting, it’s a lot of value. With the inclusion of high-speed 22 GB unthrottled data and an additional 15 GB for the mobile spot, that’s quite good indeed. Is it worth the money? Yes, every penny. Unlimited. It’s both unlimited AND fast. And now we have the last but not the least in the unlimited plan options: Above Unlimited. Think of this as Beyond Unlimited’s big boss that has everything good in the former plan but doubled. a 500 GB Verizon cloud. Do we recommend it? Yes, but only if you can accumulate that much data in so little time. This is more in favor of home workers and those who want nothing more than watching streams all day long. You get not just 50GB (the usual highest data from other companies) but 75GB of unthrottled data every month. That’s enough to make a mega mobile couch potato to shed tears. Plus you also get 20GB of unthrottled hotspot data monthly. That’s not just a backup data–that’s enough to last days continuously. And yes, you still get the classic 720p. Unfortunately they have no 1080p at all. This plan has always been an argument in forums and lives discussions all the time, but for us, it’s a bit too much. Let’s be real here: Will you be able to accumulate 75GB+20GB of unthrottled data on a monthly basis let alone 22GB+15GB? If you were with someone else in the household then yes it is, but you’ll have to pay additional costs per line. Beyond Unlimited has the right amount of GB data per month plus everything else is unlimited. Great for the business lifestyle, especially. Now that we’ve covered the unlimited plans, let’s take a gander at Verizon’s family and prepaid plan reviews. As with their other plans, one may think this is quite steep. Not to mention, it’s really not family-friendly when it comes to the price tag. Financially-conscious parents may want to step out on this one but if you have the money and you’re okay with data caps, sure, you should take this into consideration. However, just know that it’s much better to buy the Tier 3 prepaid plan for 4 lines as the 4th line does not have any additional cost at all. You may connect the family plan with up to 10 devices but for such a low cap, you won’t be able to save 8GB before the month ends. Any family plan will get you a mobile hotspot however that’s not guaranteed since they never promote such a perk. It’s only known due to the experienced families but through their Verizon representative. While these are all okay, the bad part here is the overage. If you go beyond the cap, you’re automatically billed $15 per GB. That’s a lot, we know. In short, just always stick with their Unlimited Plans. Putting it simply, for a prepaid plan, this is quite pricey. Yes, we know it’s Verizon and it has the best of everything in it but that doesn’t mean the prepaid is worth your while. Sure you can go with the starter tier but if you’re thinking about the highest tier for prepaid, you’re better off buying the Beyond Unlimited since that one has got you covered from hotspot to international text, call and data. You’re basically getting nothing much when you plan on having a Verizon prepaid other than their well-known excellent network. Yes, the starter tier caps to 500MB of data but is it worth paying on a monthly basis? Tiers 2 and 3 have data caps of 3GB and 7GB respectively which is alright, but the price gap between each other can be quite a whopper. Not to mention there is no unlimited call, text and data to Mexico and Canada for all three tiers except for 4 and 5, which includes a mobile data cap of 10GB for Tier 4 and unlimited data for Tier 5–that doesn’t include HD streaming at all though. If there’s any recommended prepaid plan here, it’s the Tier 2 aka the 4GB plan for $40/mo. If you go with the Tier 5 prepaid you’re just paying the same thing as their unlimited plan but with much lesser perks. But if you’re looking for the best in prepaid plans, look up to MetroPCS instead. Of course, Verizon presents the latest and greatest in the phone market today. They offer a good set of discounts if you purchase a particular plan that goes along with the phone. They also offer the most complete collection of phones from Apple iPhones to Huawei down to even classic flip phones like the Motorola Razr. Whether it’s a monthly payment or a full-price purchase, you can always depend on Verizon to make the most out of your phone. To be real, Verizon is always the best in selling the latest lines from the likes of LG and the Samsung Galaxy series. But if you’re just looking for budget phones, they have that covered too. They even have qwerty and flip phones too if you don’t feel like being with the status quo or have your child use the phone to play Fortnite or Roblox in it. They always have sweet plan deals along with the phone. Reasonable charges and great area coverage. We had AT&T service before which had good customer service and a low rate for our old cell phone but, we could not get reception in the mountains (Lake Arrowhead). We were told that most people there had Verizon for their cell phones and was the only one that could get reception in that area. I'm 62, not a cell phone genius. The people at Verizon are the very best at helping me to manage my phone and learning new things. My phone is a Samsung Galaxy Note S8. I love Verizon, take my word for it, they're the very best! From time to time, Verizon offers a cut in their regular prices in which, if you have the opportunity, you should definitely take it. No matter where you are in the country, Verizon has you not to worry about signals at all. It’s a tried and tested coverage that other carriers cannot overpass. It’s the widest national coverage versus any other networks and that’s a fact. However, 4G LTE coverage can be absent in some areas in the country. 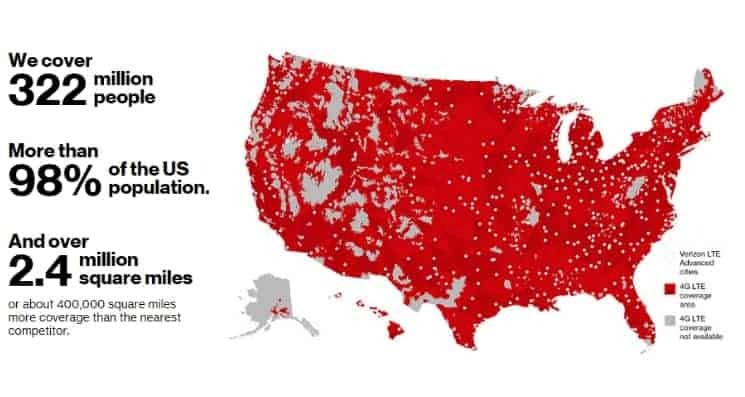 Verizon in general, sure it coves more than 98% but the 4G LTE coverage is much lesser than that. If you’re still pretty skeptical if it does cover your area, then you can take a look at their interactive map right here. The display has been updated as of October 2, 2019. Contrary to everything good about Verizon’s network performance, we have to admit (along with every experienced Verizon user) that their customer service really needs some improvement. It’s not the worst customer care out there but there’s just something off when it comes to their hotline and even physical store. It has, however, made some improvements compared to their poorer customer service in the previous years such as faster response time and hiring more knowledgeable representatives in the stores but we know they can still do so much better. Then again, it’s no surprise that a customer service is the downside for a telecom company. There isn’t any excellent customer care at all in any network; only decent ones. I’ve used Verizon Wireless for the past 6 years. We have a home in the country and when lots of us are there several of our friends ask to use our phones because they can’t get out or keep dropping their call. Verizon gets out every time. I’ve used other providers in the past and am almost always able to make my call. On the other hand, the hotspot option really works with my iPhone and Verizon. The few problems I’ve had their service dept was able to get me going with no problems. And I also believe that the pricing is very fair. I have been with Verizon Wireless for many years and the reception and customer service has been great. Easy access to Verizon stores for help resolving issues also. Data prices could be less costly however. I love Verizon. I think the unlimited data is a little expensive but I love their coverage and service. I think they are the best wireless provider out there by far. Verizon has always been in a constant battle with AT&T, T-Mobile and Sprint. While some may argue that the others are better, for us, as well as a huge percentage of phone users, will say Verizon takes the crown. It’s the choice for many people who want to purchase a brand-new phone. This is because Verizon has always led the competition on providing the latest mobile devices with great cell phone plan bundles. Not to mention their marketing is just over-the-top and highly effective for people wanting a fresh start with a fresh phone. Great phone bundles featuring the latest in the market from the likes of Apple and Samsung. Prepaid plans still have the same good network and 4G LTE speed but the overall price and lack of anything else make this a second thought. Family plans may look like bargain deals on the outside but in reality, it’s better to buy a prepaid plan for 4 lines since it costs less and provides a higher data cap than the highest family plan data cap. Verizon always sells the latest mobile devices in the market along with sweet bundles. Is Verizon the number one phone carrier in the USA? Among the Big Four network companies in the USA (Verizon, AT&T, T-Mobile, and Sprint), Verizon has always been at the #1 spot when it comes to all-around reliability, sufficiency and overall performance. Hailed by both critics and experienced users, Verizon is what the other companies have always wanted to be in terms of consistency. Nobody does it better than these guys. Is Verizon’s network quality and speed really that good? It’s hard to keep up for most companies to keep their data speeds on a constant level of swiftness nor signals being always strong. At Verizon, there has never been a problem with that at all. They’ve always kept everything on a controlled level and have always strived to be the example of being a great network that they are today. Are the expensive prices worth it? If there’s any shining example of how an unlimited plan should be based on its perks, nobody does it better than Verizon. Sure, everything is quite expensive in Verizon but that’s because you won’t find any better network quality than theirs. Plus they have a lot of perks for the unlimited plans. And we do mean A LOT. Is it good to carry with when I’m a businessman? If you’re always on the go and on constant communication with co-workers, clients, and bosses, don’t settle for anything less than Verizon. No matter where you go, communication will always be at a solid pace. Is it recommended for travelers to choose Verizon? Same goes if you’re the traveler type especially when you’re the cross-country fellow who’s always on the move. You won’t find a better network than Verizon when it comes to a reliable service and strong coverage whether you’re in the metro area or somewhere more rural. Are there cheap prices in Verizon? We’d like to say yes but if you compare it to the other carriers in the Big Four, the others are much cheaper, especially T-Mobile and Sprint. There are expensive ones and there are TOO expensive ones. The former being in a way that it’s worth every penny whilst the latter being the point where you could have settled for a cheaper plan that offers the same or even more than Verizon. We’re talking about their family plans and prepaid plans. Sure, they both have the same reputable quality of Verizon’s network but what they offer for those plans do feel underwhelming and lackluster. Are there overages in Verizon? Nothing else is worse than having to pay more just after you hit 10.1 GB from your 10GB plan, right? Unfortunately, overages are present in Verizon therefore you have to be careful in how you use your data. Again, you won’t get any other better network than Verizon. With its prices that pay for themselves and a trusted consistent internet speed, it’s those reasons why Verizon is heralded as the #1 telecom company in the United States of America.